Stanford senior midfielder Andi Sullivan was awarded the Missouri Athletic Club Hermann trophy last Friday. She is the fourth Cardinal player to win the highest honor in college soccer. After being a finalist last season as a junior and a semifinalist after each of her first two years under a Cardinal jersey, Sullivan joins former Cardinal Kelley O’Hara, Christen Press and Teresa Noyola who won the award in 2009, 2010 and 2011, respectively. This is Sullivan’s third postseason individual award, as the senior was also awarded the Senior CLASS Award and Honda Sport Award for women’s soccer earlier this season. Moreover, she is a finalist for the Collegiate Woman Athlete of the Year and Honda Cup, which will be awarded in June. Sullivan took the lead of the Stanford team this season, controlling the midfield and adjusting the tempo of play. 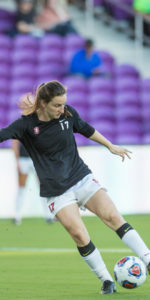 After leading the team in scoring and assists in 2016, the senior took a more ambivalent role on the team, interchanging with any of Stanford’s four defenders when needed. The senior had to miss three games this season, as she was called by the United States National team for games against Canada and South Korea. Sullivan was also named to appear in the United States National Team camp on Saturday. Yet she was once again an All-Pac-12, All-Pacific and All-American nominee for her last season on the Farm.